Yesterday, a person driving en expensive Bentley Azure drove into an equally expensive Mercedes S Class... and an Aston Martin Rapide, a Porsche Carrera Sport, and a Ferrari F430. We can all discuss wether this is newsworthy, but when one filthy rich person drives into four other filthy rich people's cars, the social worlds just goes into overdrive. It didn't help either that the driver was a blonde. The newspapers and bloggers covered this as well, and it tells an interesting story about the different levels of value. From the good, to the bad, and the ugly. In a real-life story like this, value is a combination of the story itself and the pictures. People do not just want to read about it. They want to see it. To create value for your readers, you need to provide both. And here are three examples of those who did it well. The article that Sky News provided contained most of the things news providers need to do. It had a story. It included images. But more importantly, it was mixed together to support each other. 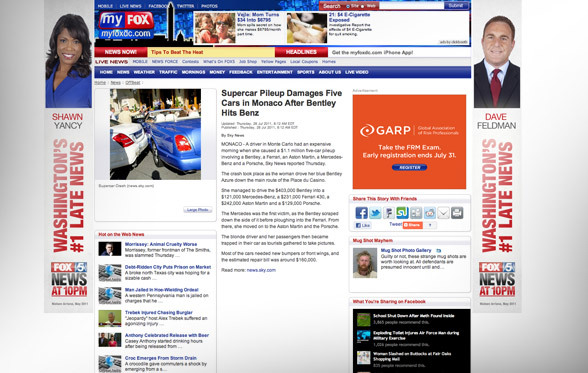 Many newspapers separate the two - often because of limitations in their publishing system. They will have one big block of text, with some of gallery at the top (or worse via a link in the sidebar). You don't want to do that. The story and the "graphics" needs to work together. Another newspaper that did this well was Daily Mail. Their story was actually better than Sky's, and it was build upon the same principle. 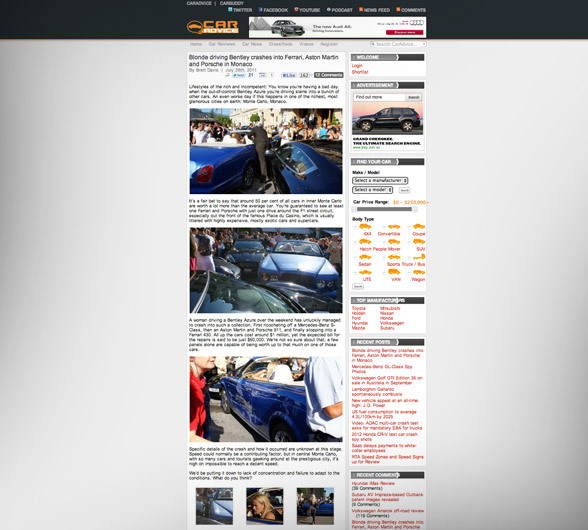 They also added a graphic description on top of the images, to highlight each car, as well as the cost. This is an excellent way for newspapers to add value. This concept, however, isn't limited to newspaper - anyone can play this game. Many blogs covered the same story. Here is one from Car Advice. They also provided the story. They also provided pictures, and they also mixed them together. And as you can see, the images they provided were different from the ones in mainstream press. They are trying to stand out. So, who didn't do it well? Fox News didn't provide any value. Sure they covered the story, but it was just designed to be 250 words + a picture. We have now moved away from reporting and being a journalist, and into the realm of content marketing. The story doesn't really tell you anything, and the picture is just a thumbnail. It is reduced to graphics for the purpose of "shining up the page." The reader is not taken into consideration. 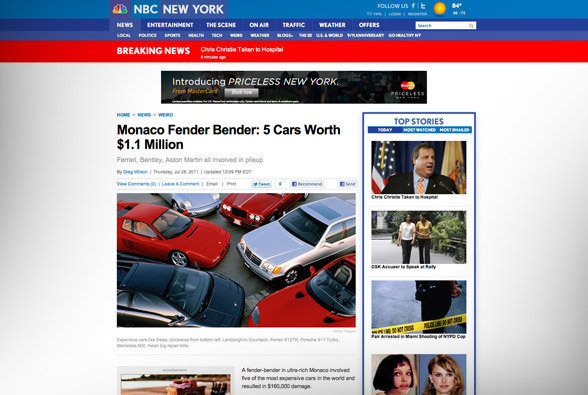 Taking another step away from providing value, and we find the article provided by NBC. It is the same story, but instead of providing a picture, they went out to Getty Images to buy some random photo. I don't understand this tactic at all. When a reader sees this page, not only will it waste their time, but the picture makes the whole site seem completely out-of-date. Why are they hiring journalists to write articles like this? This is not even up to the standard of amateurs. Business Insider scrapes the very bottom of how low you can get. The story itself is a mere fraction of the story provided by Sky News or Daily Mail. It doesn't really tell you anything. But the worst part is the picture. Instead of using a real picture (which was easily available), the reporter decided to go to another site, and find a picture that had nothing to do with it. This article is providing misinformation. 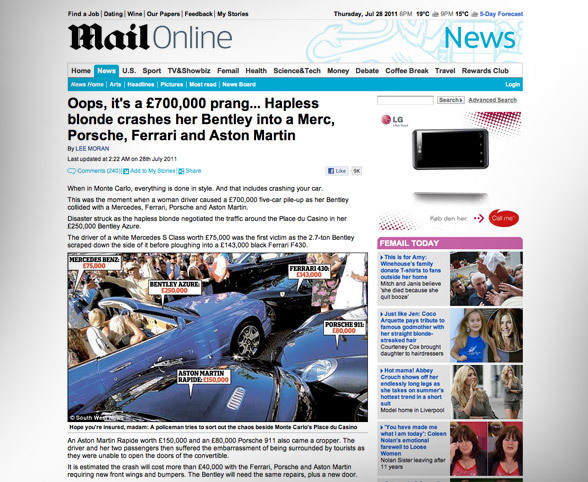 When people see that headline and that picture, they will think the Aston crashed into a taxi. 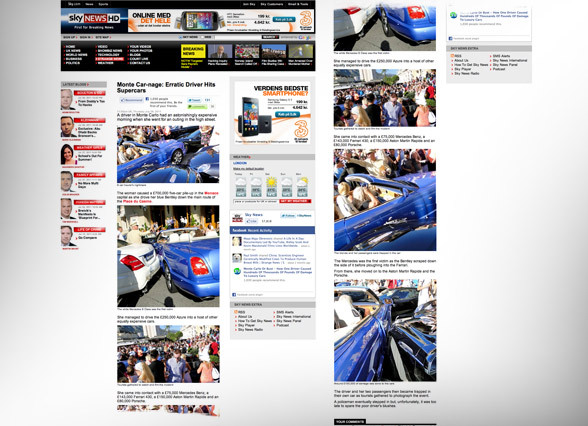 This is link-baiting of the worst kind, which they back up with a link to another article about "25 Ferraris that were destroyed in car crashes." And if you are still not convinced. 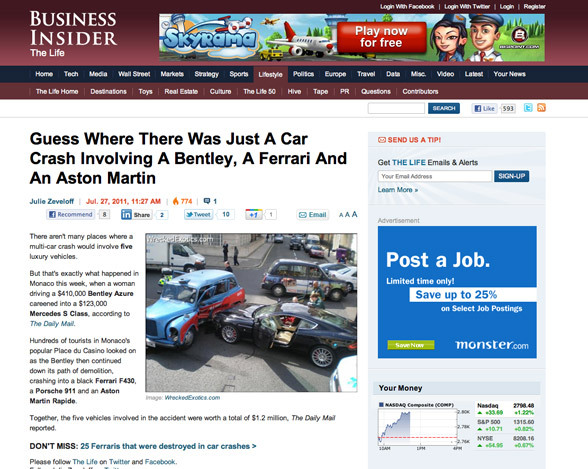 Three hours later Business Insider published "PHOTOS: 15 Maseratis That Were Destroyed In Car Crashes," because their publishing system told them that car crashes were hot keywords at the moment. It is even worse than the kind of content spam Demand Media is creating. It is content scam. This is just a simple example of something that happens with nearly every story. It starts out reasonably well, but then "the internet" takes over, and we end with this content marketing mess. Another example is the coverage of the terror attack in Norway. Most newspaper and blogs did a great job just following the event. But then we had newspapers like The Sun, who wrote, "Al-Qaeda" on it's front page, and just made up a story. And in the days following the event, the attraction of the high page views meant that most newspapers fell into the content marketing trap. A quick look at the newspapers here shows that they have written around 200 articles about it - in the past 7 days alone. That is not news. That is content marketing. The problem is that in the past 10 years, the value of news, in combination with the abundance of sources and ease of publishing, are moving respectable newspapers closer to the world of content marketers. And content marketing is easy. You don't have to be a journalist to write those articles. You don't need to spend four years at school. Anyone with a computer can do content marketing - even complete amateurs with no journalistic background whatsoever. But it is hard to create value+story. That takes skills, learning, and experience. Amateurs can do value+story too, but only the most dedicated ones. The result is that the news industry is in a dead-zone. There is very little differentiation. The quantity is running rampant, and many stories are reduced to page view snacks. 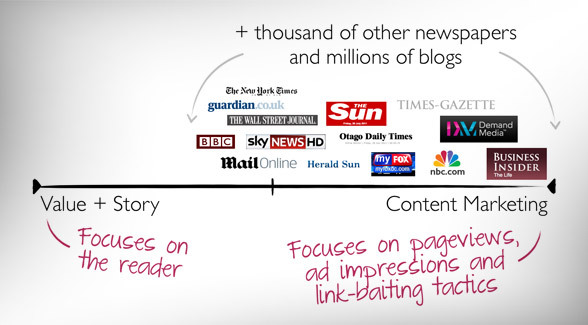 Newspapers and blogs try to raise themselves above the pack, but only a few are doing it consistently. And without consistency, you cannot establish trust. We see it with the NY Times, who is one the of better newspapers. But only 0.68% of their online audience have turned into subscribers. They are not giving people a good enough reason to subscribe. They are in the dead zone. There is too much noise. Stop being a content marketer. Be a journalist. Raise yourself above the pack. Focus on the things that are hard to do. Do the things that the content marketeers cannot do.